You are currently browsing the archive for the Anza-Borrego category. 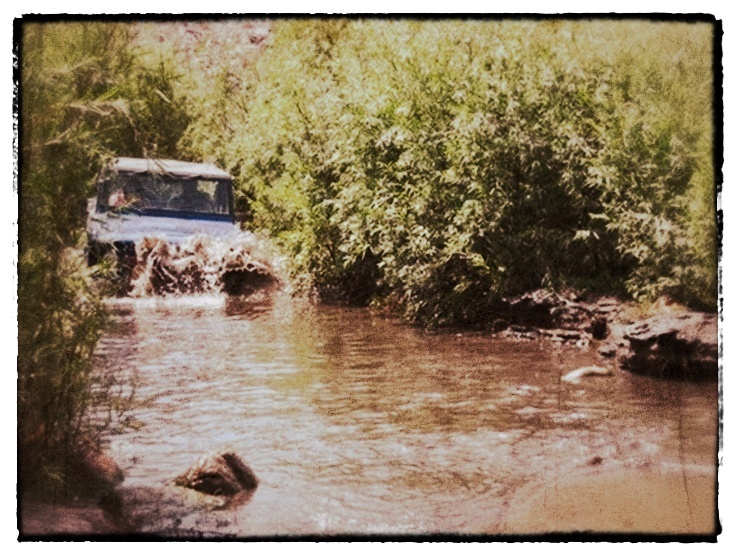 Attempting to cross the creek in Anza-Borrego’s Coyote Canyon. Change of plans. Instead of going to the old calcite mine, “Borrego” Paul decides he’s going to take us to Coyote Canyon which, he says, isn’t near an earthquake fault zone, “it’s directly on it.” That’s why there’s a year-round creek that flows here in the desert. The creekbed follows the fractured rock of the San Jacinto fault zone which separates the mountain ranges that run through Anza-Borrego, the San Ysidro on the southwest and the Santa Rosa on the northeast. “Borrego” Paul’s intention is to show us this unusual riparian wetlands which support dense stands of willows as well as cottonwood trees, acacia, and California fan palms. 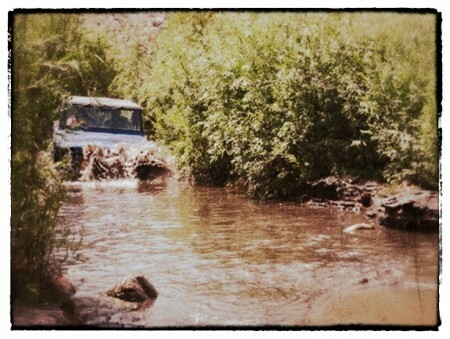 We’ve made two crossings through the creek without any problem, but it’s when Paul decides to attempt a third one, in water a little deeper and wider than the others, that his Jeep, Ol’ Paint, up and dies. “Come on, baby,” he says, trying to sweet talk her into moving. But Paint will have none of it. Standing up to her headlights in murky green water, she wheezes and backfires but refuses to move. Meanwhile, water is quickly seeping into the car from underneath the doors. We are in the middle of nowhere, approximately 6 miles away from the nearest paved road, on a blistering hot day with a dead vehicle. Ol’ Paint does just fine. Ten minutes later we are flying across a dry sand wash heading for the open desert with no particular destination in mind. Another adventure about to begin. The old pool at La Casa del Zorro in Anza-Borrego. That night I slept without the air-conditioning. Instead, I threw open the French doors of my bedroom but at daybreak the light and heat streamed in through my open doors even though it was not yet seven in the morning. So I got up and put on my bathing suit and quietly slipped into the pool in the courtyard, floating in the shadows cast by a honey mesquite tree. 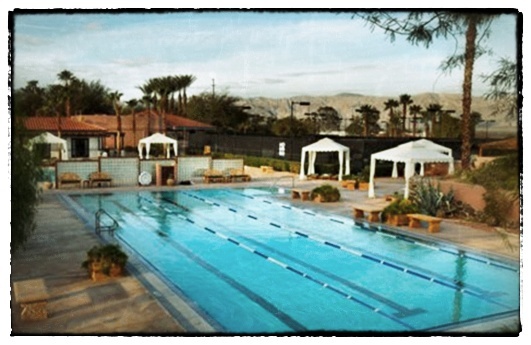 There are few things more pleasant than swimming alone in a pool shortly after daybreak. An hour or so later, “Cholla” Dale emerged from his casita, squinting at the bright desert morning. He came over and sat next to the edge of the pool in his bathrobe. “How long have you been up?” he asked. I told him. He nodded without saying anything. After awhile he went back to his casitas and came out in his swimsuit. He paddled around at one end of the pool while I made little ripples in the water at the other. Around nine we ordered a pot of coffee and breakfast from room service. We ate next to the pool, not talking but just looking around at the papery bougainvillea and the spiky succulents and cacti in the garden as if we’d never seen plants like this in our lives. “What’s the game plan?” “Cholla” Dale said when he’d finished his second cup of coffee. “Cholla” Dale nodded his head. “An old calcite mine,” he repeated. “What, exactly, is calcite?” he asked. I told him I had no idea. 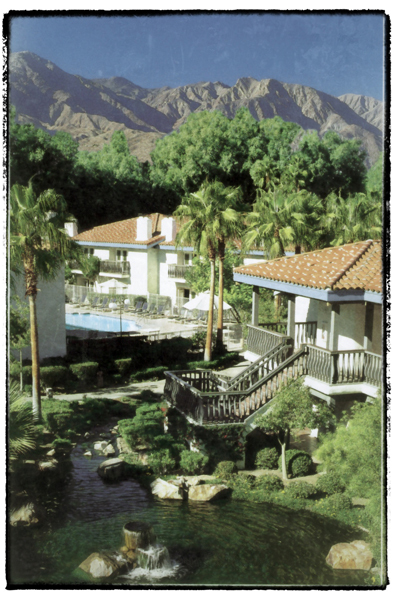 A postcard, from 1999, of La Casa del Zorro in Anza-Borrego. From Tucson I drove west, out of the Sonoran Desert and into the Mojave, the smallest desert in the West, and then south to Anza-Borrego, two hours east of San Diego. 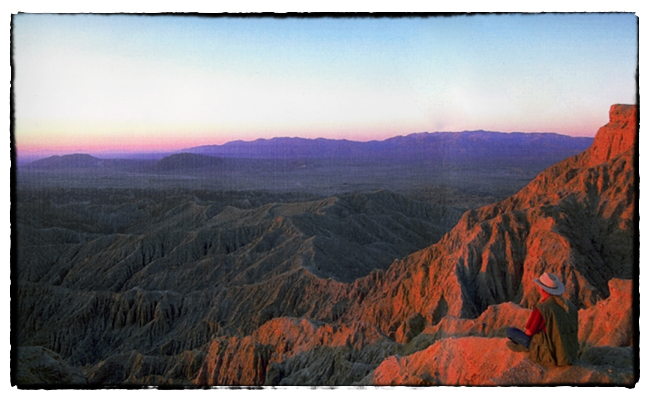 There was a time, back in the mid- to late-90s, when Anza-Borrego was considered the new secret desert hideaway in California, during a time when Palm Springs was on the outs and nobody went to Death Valley anymore. In a period of about five years—from 1996 to, say, 2001—I was asked by a number of publications, including National Geographic, Los Angeles Magazine, Sunset, Westways, and the Los Angeles Times magazine, to write about this hot (literally) new getaway. And I’d always stay at La Casa del Zorro, partially because there weren’t a lot of options but also because I liked the desert glamour of the place. It was relatively small (44 poolside rooms and 19 one-to-four bedroom casitas) and quiet and had a certain desert elegance to it (which was reflected in four-star, four-diamond rankings). Some very memorable things happened to me while staying at La Casa del Zorro. Some I wrote about; some I did not. I had not stayed at the resort for ten years so I when I got in to Borrego Springs late yesterday afternoon, I was anxious to go out and see how the ol’ gal was doing. Not very well, I’m afraid. The entrance was blocked off by a chain-link fence with a No Trespassing sign hanging on it. Seems in the intervening decade La Casa had died. Back at my hotel, the classic Palms at Indian Head, I had a beer at their restaurant, the Krazy Coyote, and asked the bartender what the hell had happened to La Casa del Zorro. Seems I’d missed a lot since I was last there. 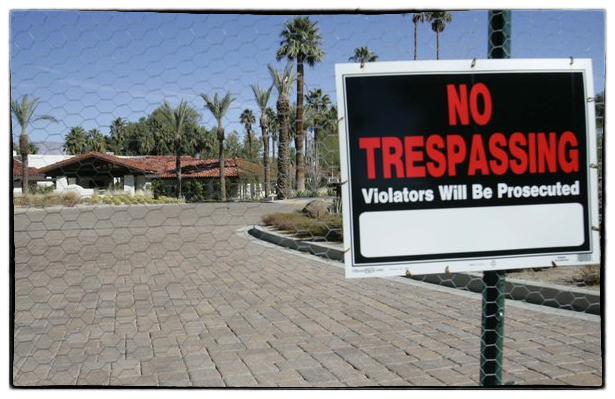 About four or five years ago, the Copley family, which had bought the resort (then unimaginably called The Desert Lodge) in 1960, sold the troubled property for something like $2.5 million to a developer who owned a golf course with upscale homes on it just down the road. He renamed it Borrego Springs Ranch. The guy put another $7 million into the property in a major renovation effort. Bad timing. The economy tanked and the resort was closed in January 2010. And it’s been closed ever since. Supposedly the whole 38-acre resort, including the freshly renovated rooms, many of which were never opened after the renovation, is on the market for $3.3 million, which seems like a bargain to me. If I was a Gordon Gecko-type I’d buy it in a heartbeat. Not to restore it as a resort but just to use as an incredibly secluded desert hideaway. A place where I could float alone in the resort pool late at night, watching falling stars streak across the inky sky.